"The last statue of Vladimir Lenin in the Central Park of Dushanbe is to be replaced with a statue of Rudaki, Persian poet of the 9th century," Iranian web site Mehrnews reported the other day. "The Communist Party of Tajikistan appealed to President Emomali Rakhmon to permit it to move the monument to its headquarters." Reconstruction of the Central Park is under way now, and the new monument is to be erected there on the eve of the 1150th anniversary of Rudaki. Tajik communists sent the request to Rakhmon on November 7, the day they celebrated the 90th anniversary of the Great October Revolution. Ismoil Talbakov, Assistant Chairman of the Communist Party, told Ferghana.Ru that the party was ready to take the monument and that the authorities had not yet responded. The bronze monument to the leader of world proletariat (sculptor Vladimir Kozlov) is a replica of the monument once erected on the premises of the Smolny Palace in St.Petersburg. Erected in 1926, it belongs to the Republican Art Fund. According to Muzaffar Azizov of the Department of Historical Legacy of the Tajik Ministry of Culture, there are about 50 statues of Lenin in the republic nowadays. Most of them, however, are not registered. They were erected in the 1960s and 1970s, when every new administrator at whatever level considered it his duty to have another monument erected. Artist Isufjan Sangov told Ferghana.Ru that the largest monument to Lenin in Tajikistan weighing 270 kg was demolished and sold for scrap metal in 1992. The monument in Khorog, administrative center of the Gorno-Badakhshan Autonomous Region, is located at the highest point from the sea level. The highest statue (12 meters high) is located in Khujand, the administrative center of the Sogdi region. Three monuments to Soviet heroes (Lenin, Brigade Commander Tomin, and one Shatalov, once chief of state security of the Dangarin district) were dismantled in the Kulyab district. 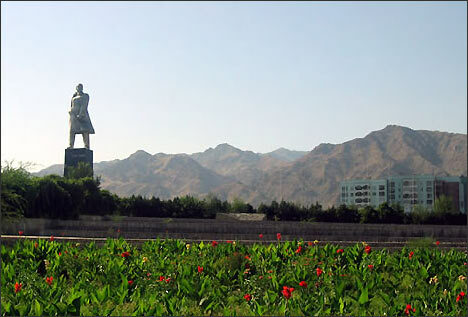 "By and large, Tajiks like monuments to Lenin," Azizov said. A statue crafted by sculptor Skoblikov of Ukraine can be seen in the Zafarabad district even now. There are lots of monuments in schools and parks of Tajikistan. Faizi Oli of the human rights community is convinced in the meantime that "it is not Lenin the Tajiks long for, it is the Soviet era as such and its tranquility."